While throwing parties is often seen as the responsibility of our female counterparts, men—particularly bachelors–have a long history of throwing memorable shindigs. The 1949 edition of Esquire’s Handbook for Hosts states: “Granting that you are a bachelor and not a hermit…you are going to entertain pretty regularly in the apartment and not spend all of your time prowling after a pair of nylon legs.” The book goes on to teach the reader how to cook an impressive meal, mix and serve drinks like a pro, and entertain guests with conversation, games, and even fortune telling. Unfortunately, this kind of education in being the consummate host, along with the art of hospitality in general, is sorely lacking for the modern man. So today we begin a four part series on how to host a great party. Since this is one of the most popular and best times of year to do so, we’ll be focusing on throwing a holiday party, but most of the tips will also apply to throwing a soiree any old time. Today we’ll discuss the first step in the party hosting process: picking a party type or theme. The type of party you decide to throw will depend on how large or small you’d like the gathering to be, how formal or informal you want it, your budget, and the personality and interests of you and your friends. A cocktail party is a semi-formal affair that takes place earlier in the evening, say between 5 and 7, or 6 and 8, and this party can serve as a get-together before another event later in the evening. Cocktails (obviously) and beer are served, and you might like to set yourself up as the charming home bartender to dispense these drinks. You’ll want to offer light snacks or hors d’oeuvres along with the beverages. While a cocktail party typically has a two hour time span, an open house lasts longer, and guests can come and go whenever they’d like. The drinks are self-serve—beer and soda on ice, and a bowl of punch or egg nog. An open house party is great for Christmas Eve. Family and friends can come and go, and stop by between their other planned activities. A good option for those who want a classy, but more structured and intimate gathering. For a nice sit-down dinner, invite a group of friends to break bread with you, and serve them a multi-course meal—at least soup or salad, entrée, and dessert. Offer wine or beer before and during the meal, and coffee afterwards along with dessert. For younger gents and those on a budget, consider the potluck dinner. Assign everyone to bring one aspect of the meal, and enjoy tasting everyone’s creations. Casual and cozy. You knew the weenie roast would make an appearance. The party starts with some kind of active outdoor activity: ice skating, sledding, hiking, snow-shoeing, etc. 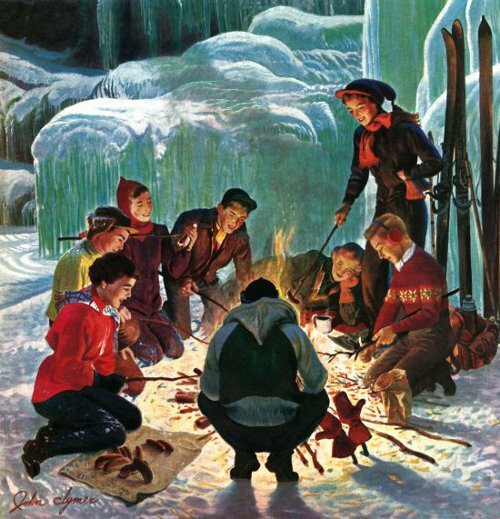 After the activity, everybody comes back to your place to warm up with hot chocolate and cider and to roast chestnuts, weenies, and marshmallows in the fireplace. Everybody brings a wrapped gift to the party (usually something cheap and/or funny). People then draw numbers (as many numbers as there are people). The person who gets number one, gets to choose the first gift and unwrap it. The next person can then choose to either “steal” the gift the first person opened or pick one of the wrapped gifts. This goes on with each consecutive person being able to choose from the things that have already been opened or from the unwrapped pile. If someone “steals” your gift, you can then choose to steal someone else’s (but you cannot steal back the gift that was just taken from you) or draw from the pile. And so on and so forth. Many companies charge big bucks to drive people around in a limo to look at the best lights in town. But you can save money by becoming your own tour guide instead. Borrow your friend’s old Suburban or rent a giant van and map out a route through town that will take you past the homes with the nicest light displays. Then have your friends over for a bite to eat, load them in the car, turn on some Christmas tunes, and become their personal tour guide to holiday wonderment. And so on. Provide your passengers with some bingo dabbers. The first person who gets bingo wins a prize. If you have friends who are outgoing and not afraid to do things less-sentimental folks consider “cheesy,” give a caroling get-together a try. 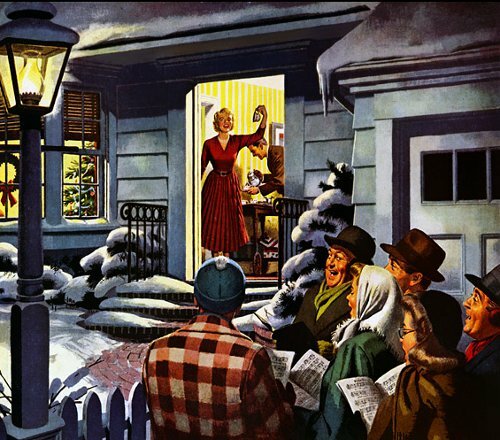 Meet at your place, and then go out to do some caroling around the neighborhood. If someone plays an instrument, tell them to bring it along. When you’re done caroling, have everyone come back to your house for some eggnog, hot chocolate, and cookies. For a twist on the caroling tradition, try a caroling scavenger hunt. Divide your guests into teams and give them a list of places to carol: a hospital, old folks home, hotel lobby, shopping mall, restaurant, etc. Assign each location points based on hard it will be to get in there and carol. In each place the team goes to, they must sing 1-3 carols and have someone there sign off that they did it. The team that returns at a set time with the most points wins. If you’re looking to do something very simple and casual, try hosting a holiday movie night. Invite people over, make some popcorn and hot chocolate, give everyone a blanket, and pop in a classic holiday film. Invite your friends over to help you trim your Christmas tree. String the lights on the tree before they get there (putting on the lights is a real fun killer). When your friends arrive, put on some Christmas tunes and hang up the ornaments together. 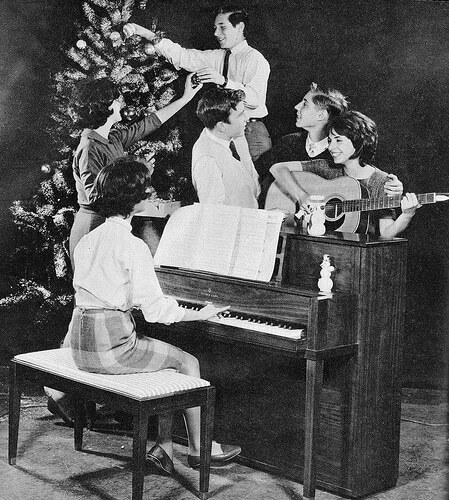 If you or one of your friends knows how to tickle the ivories, take time to gather around the piano and sing some carols. When you’re done decorating, provide people with grub and beverages for a job well done. If you’re looking for a more reflective New Year’s Eve event than the usual rocking party, try a campfire. Earlier in the evening, have you friends come over to put together foil meals. Then head out to a campfire-legal park. Everyone is asked to bring a short reading or poem about winter, change, or the new year specifically, and each guest takes a turn reading their selection as the foil meals are cooked and eaten. Then as midnight approaches, each person silently writes down their regrets from the past year on a piece of paper. At the stroke of midnight, everyone throws their paper into the fire, toasts, smooches, and celebrates the fresh start before them. 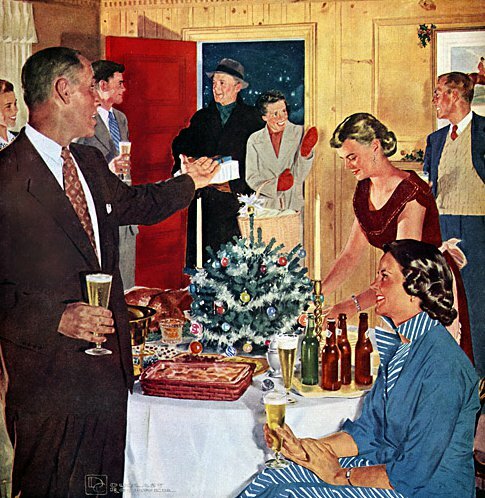 “It should be a small party, not over twenty-four guests, and it will be the more enjoyable if informal and among those who are well acquainted with each other…confine the list to twelve young gentlemen and twelve young ladies. The hostess requests each couple to dress so as to represent a particular month, which she assigns them…it will take some ingenuity to devise an effect that will mark a particular month. The guests should not assemble until nine o’clock. There should be a large clock conspicuously placed in the room, and if possible an open fireplace, with a bright fire on the hearth. The first part of the time should be taken up in guessing the months, the company gathering before the open fire in a circle. As fast as one month is decided upon, the one who impersonates it rises, makes his or her bow to the company, and recites at least four original lines pertaining to that month. The more ridiculous or witty they are, the better they will be appreciated. 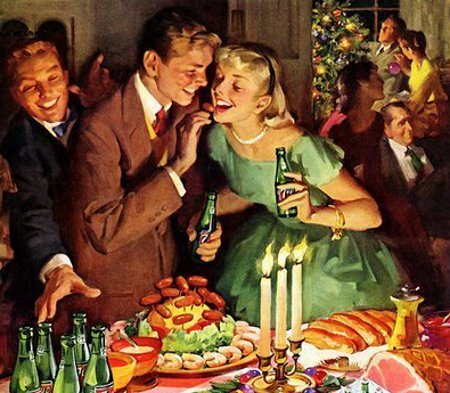 After this comes the supper, which may be as elaborate or as simple as desired, and then a promiscuous mixing of the months will cause some merriment. Just as the clock is striking twelve, there is a knock at the door. Upon opening it, there is revealed a young man dressed as a baby, in a long white dress tied about with a sash on which is printed January 1, 19—. If properly planned, the appearance of this New Year baby will cause shouts of merriment. Promiscuous mixing of months! Sounds wild! 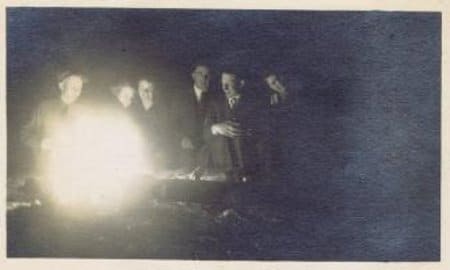 A little not-so-serious fortune telling was a very popular amusement at parties throughout the 19th and 20th centuries, particularly at a New Year’s Eve gathering. There are a couple of traditional New Year’s Eve fortune telling methods. The first is to let the melting wax from a candle drop into a bowl of water while someone thinks of a question. You then interpret the shape the drippings take as having something to do with the person’s question. “It looks like the state of Texas! This means you should take the job in Dallas!” Or you can take some saucers and place a ring on some, a dollar on others, and nothing on the rest. You then blindfold your guests, mix up the order of the saucers, and have them each reach for one. If they get a saucer with a ring, they’ll be married within the year. If they get the dollar bill, wealth is coming their way. If they get the empty saucer, their circumstances will stay the same. What are your ideas for great holiday party themes? Share them with us in the comments!